Harvard Illinois, located only a half hour or so from where I live, is home to very large white elephant. Please consider the story of the White Elephant of Harvard. When the sun sets in Harvard, the lights inside the empty Motorola plant power up and a bright glow arches across the sky in this small farm town. The massive campus—the size of 350 football fields, with a 1.5-million-square-foot building of shimmering glass and steel—demands to be noticed. Not that anyone in town could forget it. The $100 million cellular-phone plant promised to turn Harvard, a city of 9,000 about 70 miles northwest of Chicago, into a boom town. When the facility shut down in 2003, just five years after its opening, the McHenry County community was indeed changed, but not as expected. The plant, with four connected buildings, two day-care centers, a cafeteria large enough to seat 1,100, an auditorium and miles of biking and walking trails, is on the market for $18 million to $22 million. In 2005, Motorola abandoned a 75 acre wafer manufacturing site, home of multiple fabs MOS 5, MOS 6 and the Bipolar Manufacturing Center (BMC). Unlike the white elephant of Harvard, Motorola decided to raze this entire complex. The only thing worth saving on the entire complex was one giant Saguaro cactus that at times stood miraculously amidst heaps of rubble. Through all the demolition this Saguaro stood. It is still standing today. That sign looks planted after the fact but it is not. 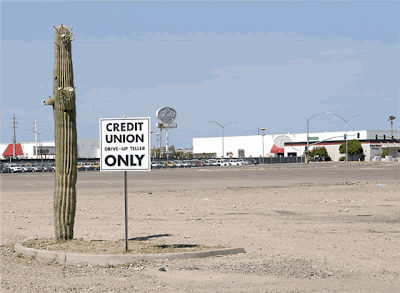 The Credit Union Saguaro Page tells the story of the demolition of the plant and how that cactus survived. Check it out. It's a quite interesting depiction of the abandonment, then destruction of a huge manufacturing facility. Another huge white elephant is about to leave its mark on Janesville, Wisconsin, about an hour or so of me. Inquiring minds may wish to consider Janesville GM plant closing sooner than expected. WED., JUL 16, 2008 General Motors Corp. said Tuesday it will lay off salaried workers, cut truck production, suspend its dividend and borrow $2 billion to $3 billion to weather a severe downturn in the U.S. market. GM said the moves will raise $15 billion to help cover losses and turn around its North American operations, including $10 billion from internal cost-cutting and $5 billion from selling some assets and borrowing against others. "In short, our plan is not a plan to survive. It is a plan to win," GM Chairman and CEO Rick Wagoner said in a broadcast to employees. Those industrial sites are the matriarchs of the herd. But there is far more to the white elephant story than industrial complexes. Indeed a stampede of white elephants is coming that has nothing to do with manufacturing whatsoever. I am talking about the death of the shopping center economic model. 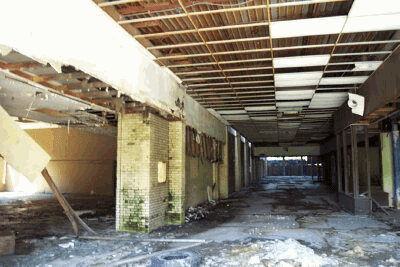 Now that the Shopping Center Economic Model Is History, one might expect to see an increasing number of distressed, dying, dead or even abandoned shopping centers. Indeed, that seems to be happening. One can even track the shopping center white elephants at DeadMalls.Com. Click on the "features" link in the upper left for a nice interactive map by state. Illinois has one of the bigger population of white elephant malls, and some even have clickable pictures such as this fine collection of images of "Dixie Square" in Harvey Illinois. Commentary on the site is very interesting as well. Here is a snip. The 800,000 square-foot mall was shuttered in September, 1979. It has been left standing since. Abandoned. I cautiously walked inside the gaping hole where the doors once were, and to my amazement there were still labels and decor on the walls from the anchor (presumably Sears) when it was open in the 1970s. This was like a living time capsule. "Curtains" and a brand name was written on one wall, and above all exits was printed "Thank you...Please come again..."
I would have gone in further, as the actual mall part was accessible through here, however, the mold was obnoxious. The mold smell was so strong it made me dizzy and gave me a strong headache, so I went out. I started walking down the outside of the anchor to find more entrances like this to take more pictures, and I saw them. Dogs. There were two Dobermans about 100 feet ahead of me in the way that I was walking. They were walking, also, and had not noticed me. Immediately I turned around and made a break for my car, which was 50 feet or so away. The dogs had noticed me running and came quickly, but I was way too far ahead of them and in my car by the time they were even halfway so they turned around and went inside the mall. This disappointed me, because at this point I was not afraid of any people I would encounter. However, dogs are a different story. They are completely unpredictable and unreasonable. After this I took my car around the mall and got out only to take pictures and go right back in, for fear the dogs may be nearby. At some points they were, but mostly they did their own thing. Also, I found out that the gaping holes at that anchor that was presumably Sears were to be found ALL over the mall. The entire mall was open. Mall entrances, anchor doors, even service entrances and the boiler area were all completely open. I walked in some doorways but only to take pictures and leave. I would have gone in further to explore, but it just didn't seem safe. There are many more pictures of Dixie in the above link. It is well worth a look. I was so intrigued by the Dixie Mall that I went looking for more information on what happened and why. I found a second site called the Retail History Blog discussing those same pictures. It turns out those pictures were from 2001. However, nothing has changed. This comment was added on May 20th, 2008. I drove around the perimeter of the mall this past Sunday (18th May 2008). It basically looks the same as in your pictures: horrible, rotting, depressing, but a very intriguing place nonetheless. There appears to be a chainlink fence surrounding the entire property. But if you wanted to get inside, I doubt anything (or anyone) would really stop you. I would never, ever, attempt to gain entry by myself. Maybe if I had some friends along (and some decent weaponry), it would be cool. The Harvey Police Dept is situated very close to the mall. Maybe you could get permission from them, though I doubt they would explicitly allow it. I come from a rather sheltered upbringing, so it surprises me that there are places in the US that are allowed to look like this. It is a truly disgusting display of neglect and apathy. Much of the resources online are dedicated to ‘what happened’ but few delve into ‘why’ - I think an understanding of the events that caused Dixie Square’s failure is as interesting as the downfall of the mall itself. Probably more important than anything else is urban sprawl, which both created and destroyed Dixie Square as well as Harvey as viable places to live and shop. So what’s driving urban sprawl? It has to be more than just the economy. And it is. There are also other considerations, such as the notion of white flight. The issues of who is moving where also drives what happens with urban spaces. As urban sprawl pushed development farther and farther out, the land value in places like Harvey plummeted. As this happened, the (predominantly) African-Americans living in poor conditions (caused by urban sprawl) on the south side of Chicago moved into Harvey and surrounding areas. Because of this, the remaining whites in Harvey also left. Land values plummeted even more, crime rates rose, and more people left. People began to shop at newer, bigger malls in newer suburbs like Woodfield Mall in Schaumburg, or Orland Square in Orland Park. This feedback negative cycle makes places like Harvey worse and worse, while constantly investing in things that are shiny-and-new. No one wins except for greedy developers and the brand new suburb-du-jour, and places like Dixie Square become the retail equivalent of a fossil record, indicating poor decisions in urban planning. In 1960 Harvey was almost entirely white. By 1980 it was over 90% black. In 1979 the mall was used during the chase scene in the Blues Brothers movie. In 1993 a young woman was raped and murdered in the abandoned JCPenney store. It's important to note that Dixie Mall is not a result of the new wave of consumer frugality that I have been talking about. However, it does show just how bad things can get when things start spiraling out of control with urban sprawl, white flight, and subsequent decay. 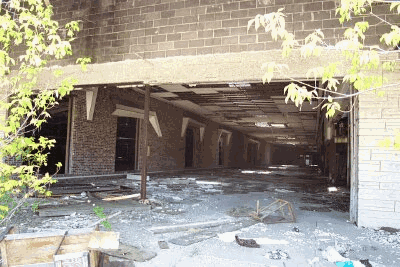 Part of the super-bull white elephant story is indeed the total decay of entire cities or major portions of cities. Harvey is clearly on that list, as are Detroit and Cleveland. However, the hollowing out of cities on account of white flight and loss of manufacturing jobs is yesterday's story. The new "super-bull" white elephant story is the ongoing abandonment of entire "ghost town" subdivisions in Florida, California, Arizona, Nevada and other places where it made no economic sense to build houses in the first place. The baby-bull story is about the pending abandonment of hundreds of small strip malls all across America that should never have been built. The herd of white elephants is both large and growing. Many large banks are doomed to fail over the housing aspect and many regional banks will fail on account on the sinking prospect of white elephant malls. This is not an inflationary process.